JVAC were back on the Decoy Lakes at the weekend fishing the Oak Pool where at the moment it’s all about drawing one or two of the hot pegs. 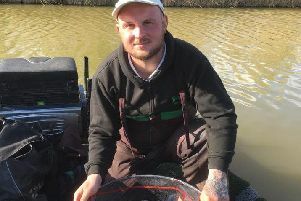 Matchwinner Ernie Lowbridge has had a fine winter season and added another victory to his list from peg 20. It is a good area but as always you have to work at it to get the best out of the peg. After a slow start Lowbridge soon realised it was a case of little feed and a single maggot on the hook that worked best and at the final whistle he finished with 55lb 7oz. Chris Baldwin came in second from peg 10, again catching on maggot for 47lb 5oz. Will Hadley completed the fram, taking third place with 41lb 5oz. Runaway winner in the Friday Decoy Over 55s match fished on Elm and Cedar was Mike Mitchell. He drew peg 10 on the Elm and fished a small Method feeder to weigh in 85lb 3oz. Also on Elm was runner-up Stan Dow. He was another angler fishing the Method feeder from peg four and weighed in 48lb 8oz. Then came Mick King with 41lb 7oz caught on a short pole line with maggot. Once again the Ramsey club match at Ramsey St Mary’s produced some good leading weights. Leading the way was Ray Myring, who netted two tench and a topped-up run to finish with 11lb 8oz. At the next peg Keith Rayment went all out for the small fish on the pole, taking over 300 fish for a level 10lb. In third place on 7lb 3oz was Jim Broadbent, but that’s where the good weights finished. Fourth with just 2lb 2 oz was Vern Edgley.